How many of your students have a smartphone tucked, away according to school rules, but really never far from reach? Surprise them! Have them take out their smartphones and use them to build summarizing skills. 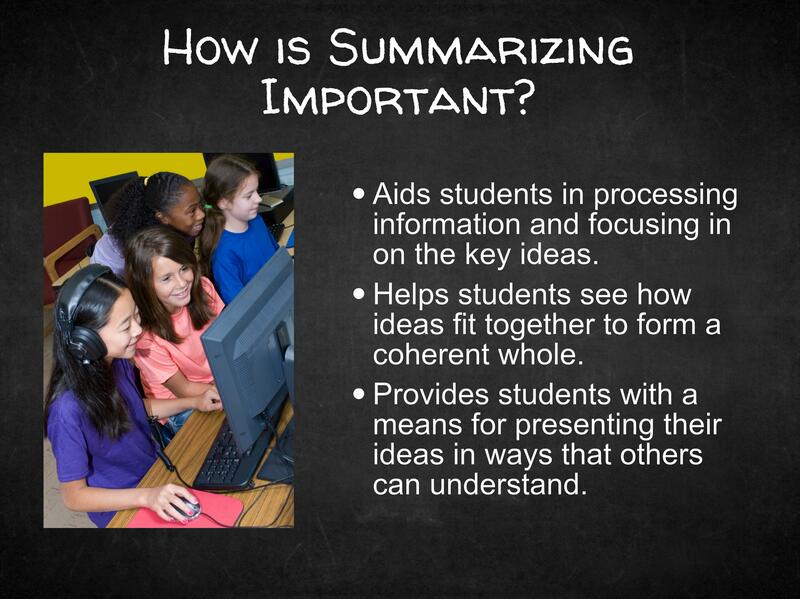 Summarizing requires students to distill the key ideas and supporting details of a text, orally presented information, a video, etc. The ability to summarize is an important reading comprehension skill for all the reasons listed in the chart. Below is a list of 10 ways to take advantage of smartphones for teaching and learning. Of course, tablets can do the same things. Check out the following two websites for additional ideas to explore. Teachers generated the 10 suggestions listed above during a workshop that focused on summarizing. The jumping off point for brainstorming was an in-depth exploration the Summarizing Instructional Strategy Guide in PowerUp What Works. Besides Summarizing, two other English Language Arts (ELA) Instructional Guides also focus on building reading comprehension skills: Visualizing, and Self-Questioning. Each one contains a definition of the skill, with an accompanying slide show, technology-enhanced teaching strategies, and case studies of classroom instruction, short videos, supporting research, and related resources.